Dinner in a Dash! 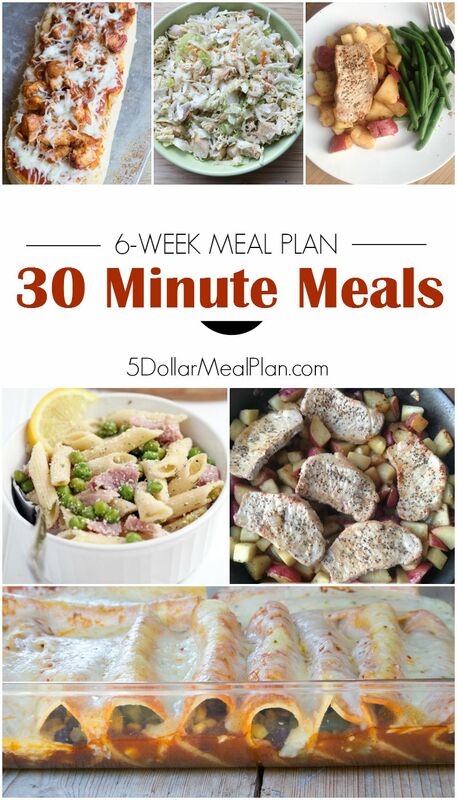 The 30-Minute Meals Plan with Recipes & Shopping Lists is Here! I want you to enjoy delicious meals in a hurry…because I know you’re in a hurry. I’m in a hurry too. And boy does that make the dinner hour stressful. That’s 30 minutes to get dinner made, on the table, eaten, and regrouped and into the van to go. While I work hard to keep our schedule balanced and free from complete chaos, we still have these moments often and I always turn to my 20 or 30 minute meals. So much cheaper than hitting the drive thru, or calling ahead for takeout. It’s time to take the stress and hectic feelings out from around the dinner hour. The meal plan contains 6 weeks worth of recipes and shopping list. Each week consists of 6 meals with a shopping list for those 6 meals. That’s a total of 36 recipes with shopping lists combined by week. If you’d like a discount on this meal plan, you can get one by joining the free 2-week trial with my meal planning service, The $5 Meal Plan. If you’re in desperate need of help in getting dinner on the table quickly, without sacrificing taste or quality, you need this new 6-Week 30 Minute Meals Plan! Here’s to getting delicious and healthy meals on the table in a dash!! !